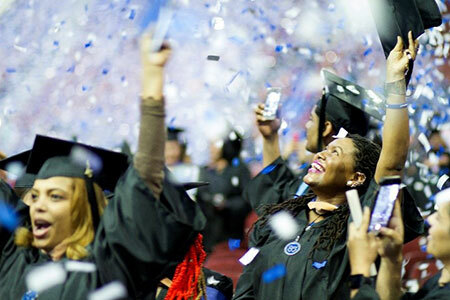 Berkeley College looks forward to graduating its largest class on Friday, May 5, 2017, at Prudential Center in Newark, NJ, as more than 2,900 students prepare to receive Certificate, Associate’s, Bachelor’s, and – for the first time in its history – the Master in Business Administration degree in Management. The graduating class includes 175 military and veteran students and 200 international students, representing 42 countries. The Berkeley College Class of 2017 comprises many graduates who exemplify the “new” traditional student, as many have overcome adversity after their families migrated to America. The average age of a Berkeley College graduate in 2017 is 28.5 years. Just over 31 percent of the graduates entered Berkeley as first-time, full-time students; and, more than 81 percent identify as a minority. Jason De La Cruz, for example, is this year’s recipient of the Robert Maher Award, given to a graduate who has met high standards of academic excellence while overcoming personal, professional or financial obstacles. A resident of the Bronx, NY, Mr. De La Cruz was 11 years old when he emigrated to the United States from the Dominican Republic with his family. He maintained a grade-point average of 3.7 while also having to look after his grandfather’s well-being and adjusting to his new home country. A resident of Paterson, NJ, Huda Shalabi is graduating with an Associate’s degree in Justice Studies – Criminal Justice, and is on track to graduate next year with her Bachelor’s degree. As one of 11 siblings she is often responsible for assisting her parents, who relocated to America from Palestine in 1989, with getting her younger sisters and brothers off to different schools. Yet she has been able to maintain high grades, having been named to the President’s List every semester. Ms. Shalabi also has balanced her busy schedule with an internship at the Paterson Police Department, further preparing her for a career in law enforcement. Then there is Jeffrey Mejia, who was born in the U.S. but returned with his family to live in the Dominican Republic until he was nine years old. Now a resident of the Bronx, NY, when Jeffrey was 13, he briefly lived in a homeless shelter with his family. He went on to lead the Berkeley College Men’s Basketball team as co-captain during its 53-game winning streak, all the while maintaining a grade-point average of 3.4, working at an Italian restaurant, volunteering at the Manhattan Bible Church Youth Group in upper Manhattan, and participating in a required internship that has already led to full-time employment. There is also Alexis Gonzalez, a first generation American of Mexican descent living in Astoria, Queens. Mr. Gonzalez graduates with a 4.0 grade-point average, and has been recognized by the Berkeley College Honors Faculty for academic performance and community outreach. While he has been gaining hands-on accounting experience through a required internship at KPM Tax & Accounting Services in Manhattan, Mr. Gonzalez ultimately wants to become a financial advisor for a nonprofit company after he obtains his CPA. “Being part of an organization that focuses on helping others for the greater good would be success in my eyes,” he says. One of his proudest moments was representing Berkeley College as a panelist during a town hall discussion CBS News assembled with 33 millennials from 12 states previewing last fall’s presidential election. Click here for more information about the 2017 Berkeley College Commencement Ceremony.